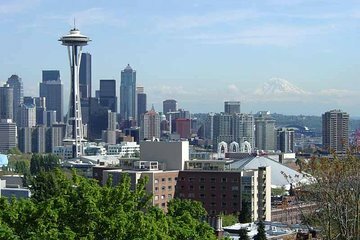 After a hotel pickup (only for those staying at downtown Seattle hotels, south Lake Union hotels, or university area hotels), begin this 1.5-hour sightseeing tour in downtown Seattle. Enjoy interesting conversation with stories and facts about the city while the music of some of Seattle’s best musicians, like Jimi Hendrix and Kurt Cobain, plays in the background. See where this is going? Think of it as a kind of pop culture history tour. Drive by Pike Place Market, one of the oldest public farmer’s markets in the United States, overlooking the Elliott Bay waterfront — with its span of parks and piers, ferry and ship terminals, promenades and public spaces; Pioneer Square, the birthplace of Seattle and the city's “first neighborhood” with great restaurants, shops, night life and pro sports; and the Chinatown-International District, aka ID, one of Seattle’s oldest neighborhoods. Also, check out the former home of Kurt Cobain and the high school where Quincy Jones and Jimi Hendrix attended. Visit Capitol Hill, with an abundance of nightlife and entertainment, it’s the center of the city's counterculture communities; the Lake Union area, where you’ll see a number of floating homes, including the one from the movie “Sleepless in Seattle”; pass by the University of Washington and find a public sculpture called the Fremont Troll. Also, stop to check out the stellar view of the city skyline from Kerry Park (note to self: bring a camera) before a hotel drop-off to end the tour. It all makes for an incredibly interesting and enjoyable introductory romp through the Emerald City. Please arrive at the departure point 30 minutes before the departure time.